The Illinois football team had a solid class of 2017 commit to the program. These players will be the building blocks for the future success of this football team. They are going to come in and hopefully, put pressure on some of the starters from the year before. 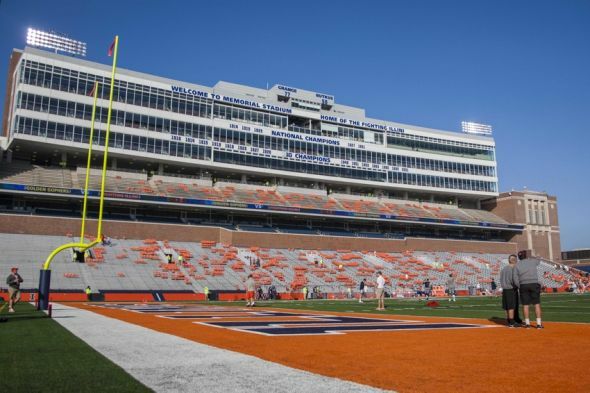 I fully expect to see some of the recruits coming in from 2017 to start for the Illini this season. They are just that talented and Lovie has a great eye for talent. The same goes for the class of 2018 as well. This will be the first class Lovie can really land some big-time recruits. 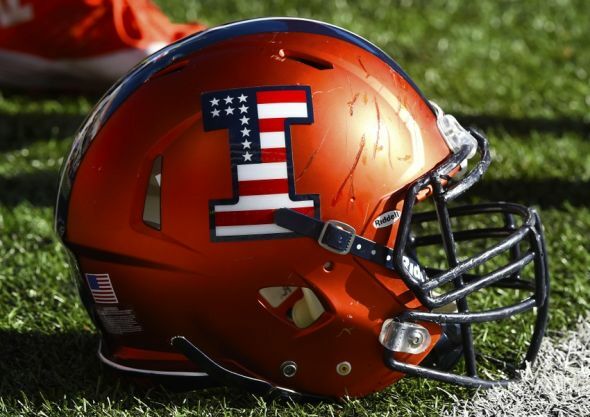 In 2018 there will be a number of talented prospects the Illini will be pursuing and some of them will even be from the state of Illinois. 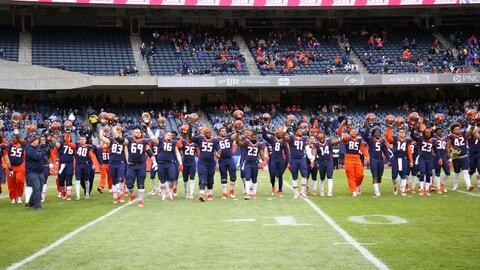 Owning the state is huge for the Illini. Lovie has to start with getting players that are high caliber from the state of Illinois and then expand out. This is what happened with the class of 2017 and I think it will happen even more with 2018. Illinois proved to the world that this can be a great program with Lovie getting a top 50 class in the first year he was in Champaign. I can’t imagine what the future will hold for this program. Here are ten players to watch out for in the class of 2018. 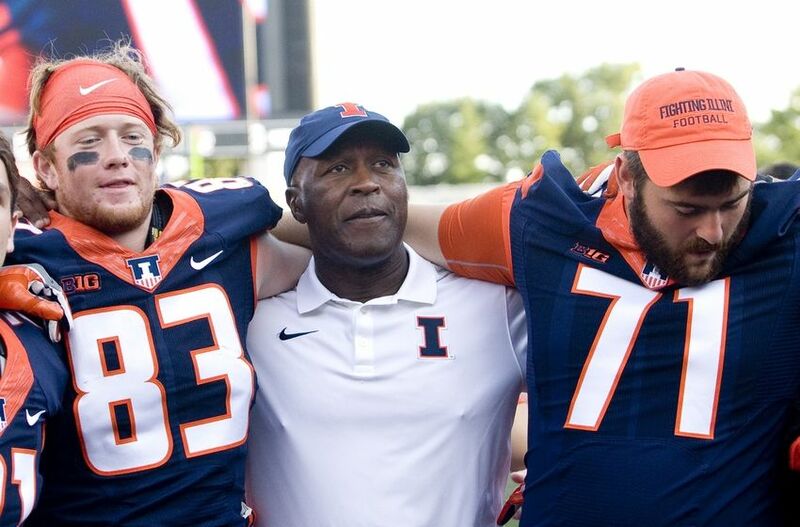 When Lovie Smith entered the Illinois football program as the head coach my main goal for him was to win the state of Illinois. This goal didn’t mean to get a handful of Illinois players that were the No. 14 ranked in the state. I mean I want the Illini to get the top tier recruits from the area. The first player I want to focus on for 2018 is Devin O’Rourke. O’Rourke is a 6-foot-6, 230-pound defensive end out of Frankfort, Illinois. He is ranked as a four-star recruit who is the No. 266 player in the class of 2018 and the No. 1 defensive end in the state of Illinois. The recruitment is heating up for O’Rourke. He already has a good deal of scholarship offers that includes Nebraska, Penn State, and Wisconsin. Illinois needs to snag O’Rourke to continue to prove they are starting to win the state again. This hasn’t happened in quite some time. The Illini already had a solid class of defensive ends coming for 2017, but adding a player the caliber of O’Rourke would help elevate the program up to a contender in the Big Ten. I think Lovie can get O’Rourke and continue to build the program from within. He is an important recruit and will prove that Illinois is here to stay. One of the underrated recruits in the class of 2018 is Micah Jones. Jones is a three-star wide receiver out of Gurnee, Illinois. He isn’t ranked in the state or the nation by Scout, but he is a four-star by 247Sports and the No. 281 player in the class of 2018. Teams see how good Jones is going to be and they have already started to offer him. He is a 6-foot-5, 195-pound wide receiver who will be a big-time player. Jones has offers from a multitude of programs including Michigan State, Ole Miss, and Mississippi State. The last time we checked in with Jones, his top six programs were Notre Dame, Michigan State, Ole Miss, Iowa, Northwestern, and Illinois. Having Illinois in there is huge. They need to snag Jones to continue making a push at getting in-state players to commit to the in-state program. Jones did visit Notre Dame and Northwestern both in January and then he will be visiting Michigan State during their spring practice. Many teams are recruiting Jones hard because of his size and ability. He is going to be special at the next level and would be a game changer for the Illini. Illinois is going to have to work hard for Jones and his commitment. 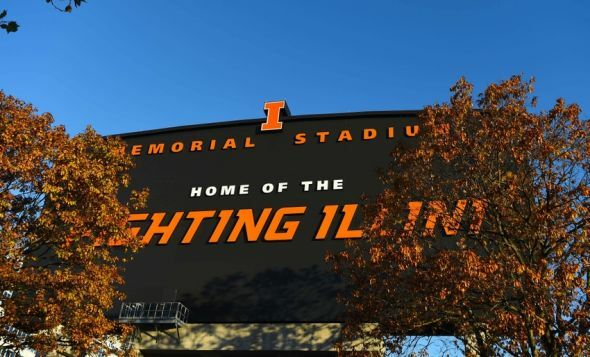 If the Illini can get him to commit then the future at wide receiver will be bright. Lovie is known as a defensive specialist and the Illini also hired Hardy Nickerson to be the defensive coordinator. That is a dangerous duo of coaching power. Illinois needs to continue to build up the defensive secondary and getting a player like I’Shawn Stewart would help in achieving that goal. Stewart is a 5-foot-11.5, 150-pound cornerback out of Bolingbrook, Illinois. He is a three-star according to Scout, but they don’t have him ranked among the state of Illinois. Looking at the teams that have offered Stewart, I would think he has to be up there in the top 10 in the state. He already has offers from Iowa and Nevada. 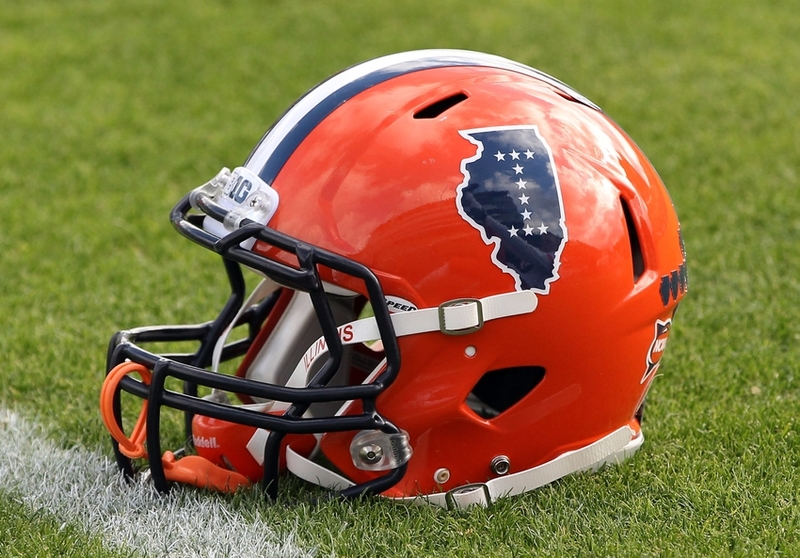 Illinois currently has a nice stable of defensive backs that are young on the team. But, getting a player like Stewart would help build the depth. I think Stewart could come in and compete day one but he is more of a 2019 starter. He will be a good player that the Illini would rely on to make plays and shut down wide receivers. I hope Lovie can control the state of Illinois and get Stewart, among others. 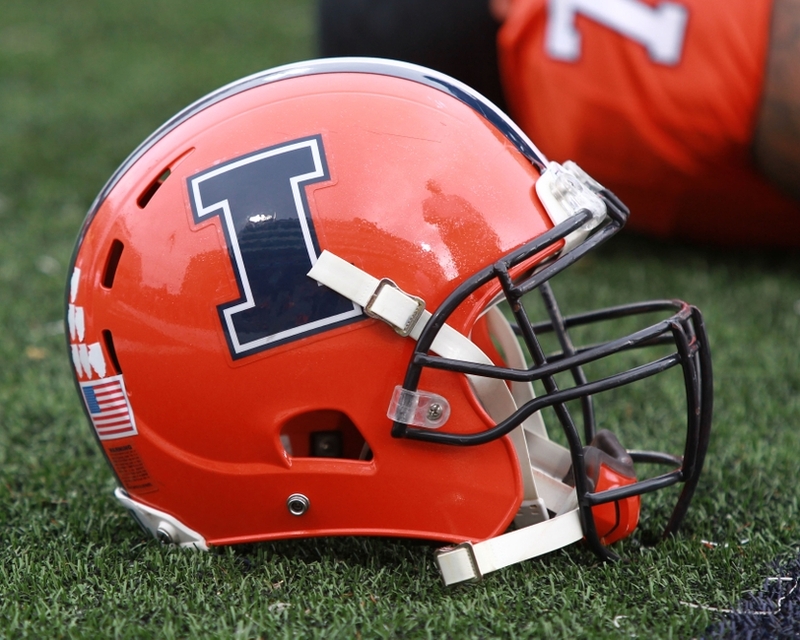 The Illinois football defensive line has some stout players right now. I expect Jamal Milan and Kenyon Jackson to dominate in 2017. But, the Illini are going to need more depth down the road and having a player like Elijah Teague to man the middle is going to be important. Teague is a three-star defensive tackle out of Chicago, Illinois. He is listed at 6-foot-3, 290-pounds and I am guessing he will continue to grow. Right now, Teague has a ton of scholarship offers including from Iowa State, Kansas State, and Wisconsin. Illinois is going to have a tough time holding on to this one. The Illini brought in some nice pieces for the defensive line in 2017. These players will hopefully develop into starters and continue the trend of sending defensive linemen to the NFL. Lovie knows that every recruiting class needs player makers, though, and that is why Teague would be important. He is going to be a special run stopper and the Illini need that. Getting a player the caliber of Teague is important to continue building the defense into what Lovie is looking for. I would be a huge fan of this snag. There has been a few big-time state of Illinois players that have transferred down to IMG Academy to hone their football skills. One of these players is Chicago, Illinois offensive tackle, Verdis Brown. Brown is a four-star recruit who is the No. 154 player in the class of 2018 and the No. 14 offensive tackle in the country. He is being wooed by many programs right now. There are a lot of schools who are still in the race for Brown and his commitment. Right now Brown has a multitude of scholarship offers from programs like Florida State, Ohio State, and Oklahoma. If Lovie can get him to come to Illinois I will be amazed. Brown has a lot to love when it comes to being an offensive lineman. I love how Brown is quick off the ball. He is in the defenders face before they even know the ball was snapped. I also like Brown’s quick burst off the line of scrimmage as well. He is not only quick off the ball but when he does make contact with the defender he knocks him off his feet. Illinois needs more elite offensive linemen and getting Brown would help with the passing and running attacks. One of the best tight ends in the class of 2018 is Luke Ford. He is a big-time player that the Illini are after. Ford is from Carterville, Illinois. Getting a player like him for the quarterback to throw to will be huge for this program. Scout has Ford listed as a four-star tight end who is starting to get some attention from big-time programs. Ford currently has scholarship offers from teams like Arkansas and Oklahoma State. I would bet his recruitment blows up within the next three months. Illinois recruited and landed another big tight end in Louis Dorsey for the class of 2017. But, the idea of having another big tight end like Ford would be amazing for the Illini offense. Ford stands at 6-foot-6, 250-pounds. I am imagining a system like the New England Patriots had a few years ago with a two tight end set. Ford brings a lot to the table for whatever team he commits to. He is not only a big player but he is also quick as well. Coming off the line of scrimmage, Ford can run down the seam and get behind the defense. His speed and size are really tough to handle for opposing teams. 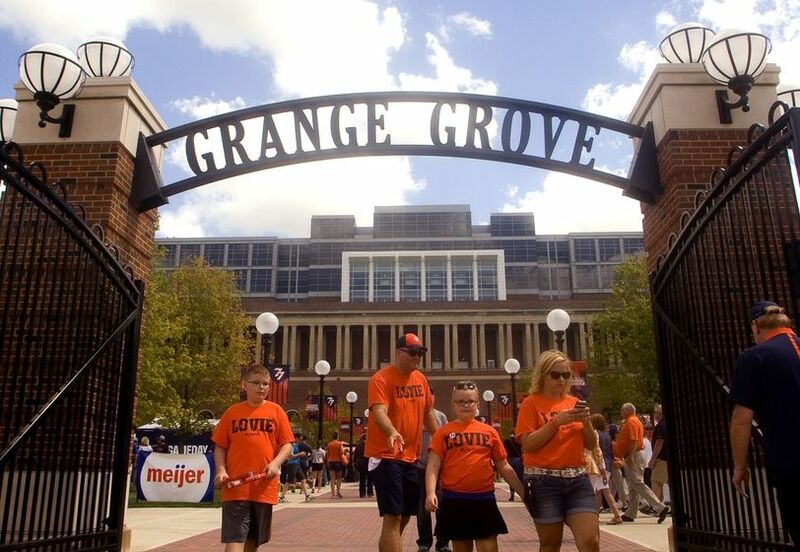 If Lovie can snag Ford it would be huge for the Illinois football program. The state has a ton of good players; now let’s win it in recruiting. Building up the defense line for Lovie and the Illini is a huge priority. They graduated all four opening day starters and they need more depth now. Heading into the class of 2018, one of the big recruits Illinois could snag to help bolster the line is Trevor Trout. Trout is a four-star defensive tackle out of St. Louis, Missouri. He stands at 6-foot-4, 295-pounds and he is a wanted man. Scout has Trout listed as the No. 91 player in the class of 2018 and the No.7 defensive tackle in the country. Trout has scholarship offers from a wide range of programs including Iowa, Nebraska, and Oklahoma. He will be extremely difficult to get for the Illini. Illinois is also listed as a low level of interest from Trout as well. The recruiting process is long, though, and I wouldn’t count Lovie out of any recruiting race. The one main issue I see with Trout is the playing time. Right now Jamal Milan and Kenyon Jackson are both extremely talented and are going to be starters for the next few years. Unless Trout doesn’t mind sitting a year, I think he might be extremely tough to get. One extremely talented player that I thought Illinois would have had a chance with is Houston Griffith. Griffith is a four-star safety out of Illinois, but he moved down to IMG Academy to hone his craft of football. 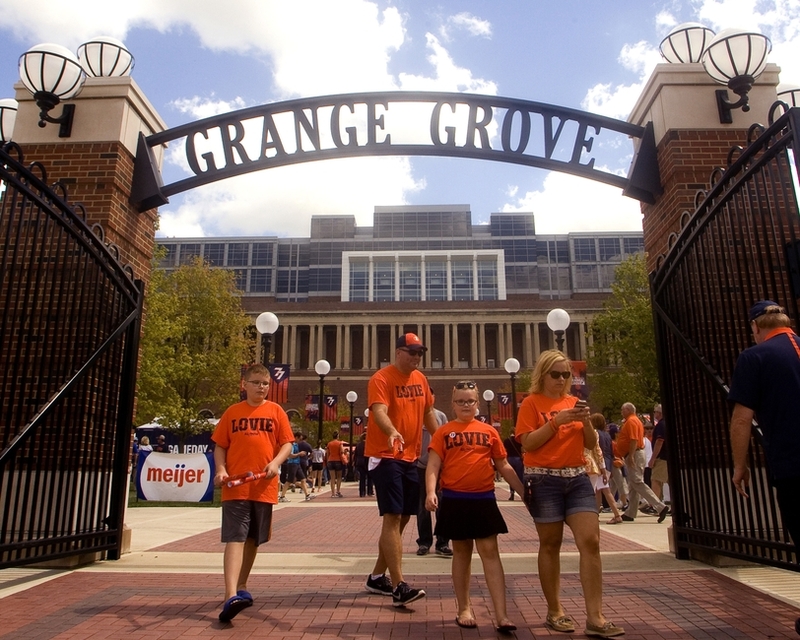 Having a player go down to IMG makes it more difficult for Illinois to recruit because before, Houston was right in the Illini’s backyard. Now, Houston is down in Florida and the big programs can look at him more often. 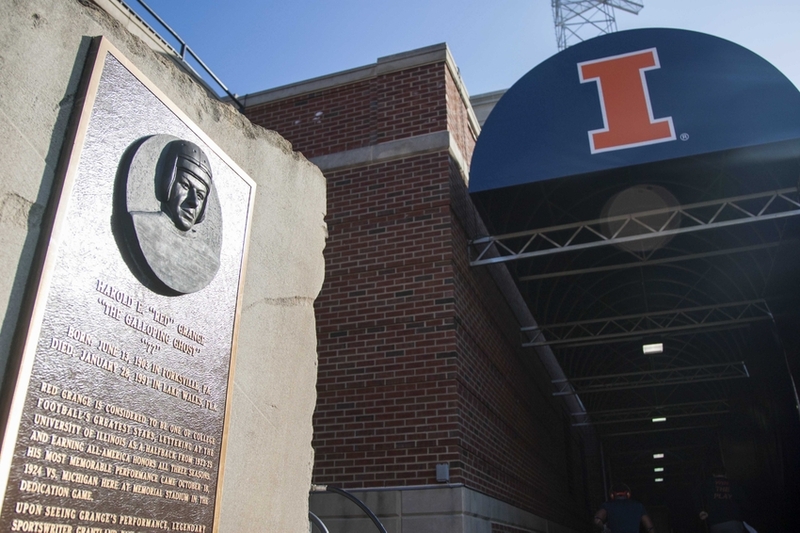 But, Illinois does have one bonus on their side that no one else does and that is the fact that Houston’s dad was an Illinois football legend. Howard Griffith was a part of some great Illinois teams in the late 1980’s and early 1990’s. He rushed for 1,115 yards and 15 touchdowns his senior season. Howard would go on to get drafted into the NFL and won two Super Bowls with the Denver Broncos. The fact that Houston’s dad went to Illinois will hopefully help in the recruitment. Illinois needs defensive back help as well. They recruited a nice batch of players for the class of 2017, but Griffith is a different level than the Illini have been able to snag in the past. 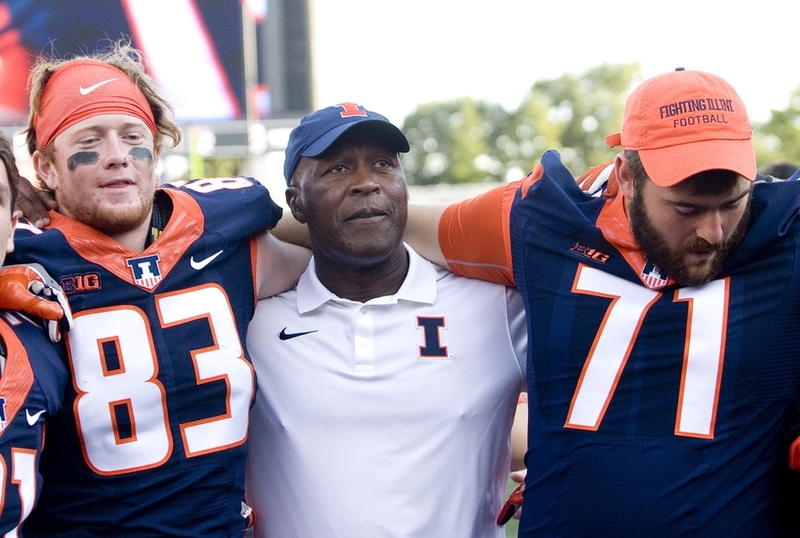 If Lovie can get Griffith to come to Illinois and play college football, then I think the defense will be legendary. I think the Illini can snag a lot of players from the state of Illinois in the class of 2018. There is some solid talent and it would help build this program. Getting a player like Wyatt Blake would also aid in getting this team to where it needs to be as well. Blake is a three-star offensive guard out of Crystal Lake, Illinois. He isn’t ranked yet by Scout, but he does stand at 6-foot-4, 300-pounds, and he has programs looking at him. Other than Illinois, Blake has scholarship offers from programs like Vanderbilt, Virginia, and Missouri. I am sure as time goes on the recruitment for Blake will get more challenging. He is a talented player and teams will start realizing this more and more. But, if Illinois can get this talented offensive lineman to come to Champaign then the future will be bright on offense. 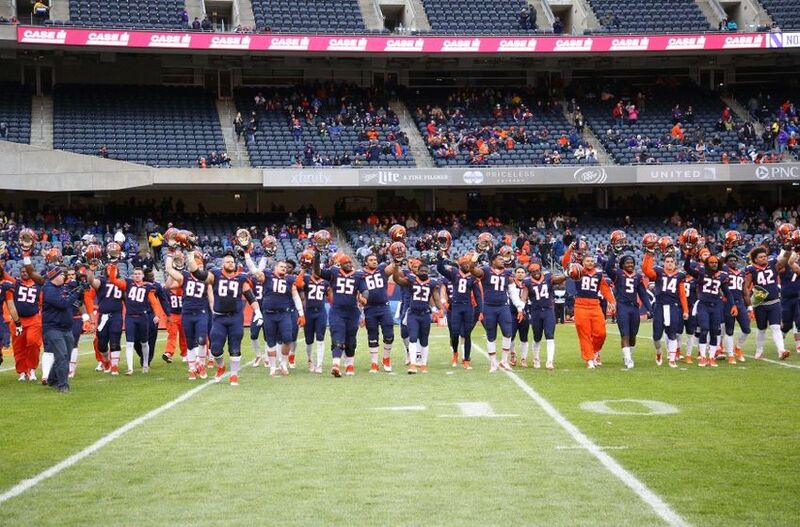 Illinois is sketchy at best on the offensive line this upcoming season. There are a few seasoned veterans but then there are a few players who need some serious work. If Blake would come into the program I think he would have a chance to make an impact early on. The main offensive linemen will be graduating after this season and Blake could have a chance to squeak into some starts in 2018. Building the depth on the offensive line is huge for the Illini. This is something we haven’t seen in quite some time. 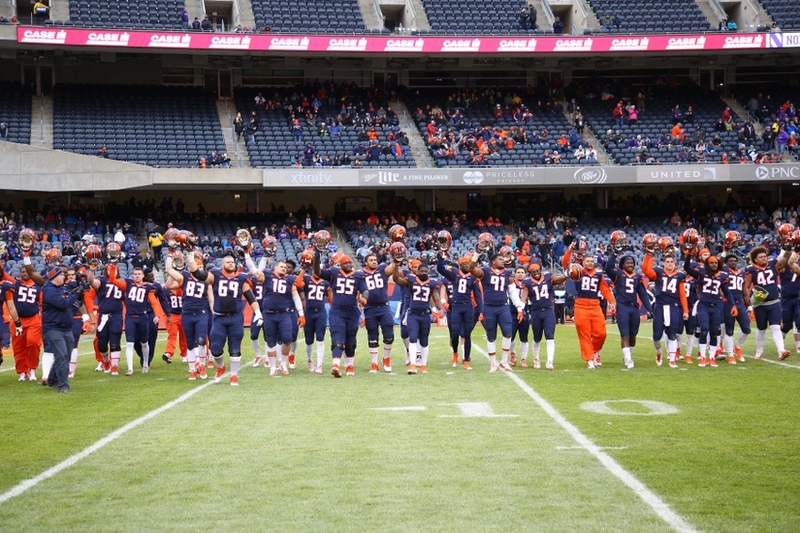 The quarterback situation for the Illinois football team isn’t set in 2017 by any means. They have a bunch of questions that need to be answered. But, heading into 2018 things should be more stable and getting a player like Coran Taylor would help as well. Taylor isn’t ranked by Scout and I believe he is flying under the radar with most programs right now. The thing that excites me the most about Taylor is he stands at 6-foot-3, 205-pounds and he is a duel-threat quarterback. Illinois has a legit shot at snagging Taylor for 2018. He is from Peoria, Illinois and the Illini need more quarterback depth. On the roster right now they have Chayce Crouch and Jeff George, who will both be around in 2018. 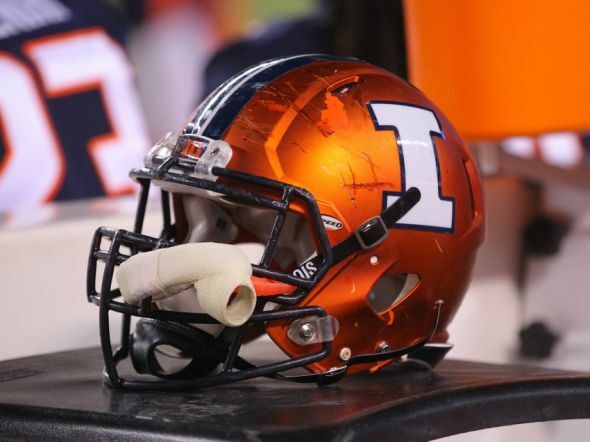 Illinois also has Cam Thomas and Dwayne Lawson coming in from the class of 2017. Thomas is a true freshman and Lawson is a transfer who I believe will have two years of eligibility remaining. So, while it looks like a crowd for the starting quarterback job, none of these players have proved anything and there is a wide open competition. I could see a player like Taylor coming in and competing for the starting job. He has a high upside and I hope the Illini can snag him.